From the Knuckleheads Saloon in Kansas to the Harmonie Bar in Bonn. 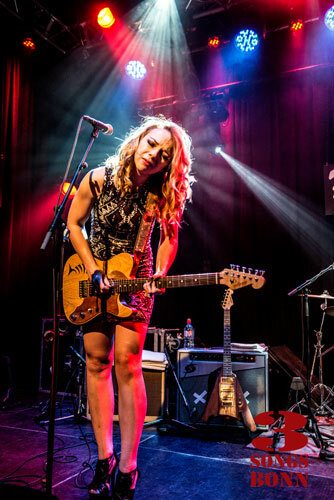 Samantha Fish has come a long way in a short time. 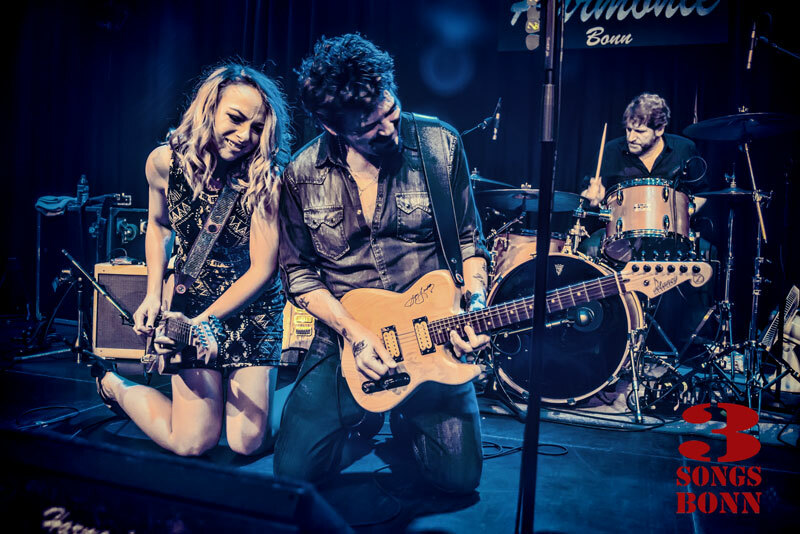 Before her recent Bonn show with Mike Zito she supplied some tips for keeping sane on the road, along with news on the next disc she’s working on. Call it Blues? 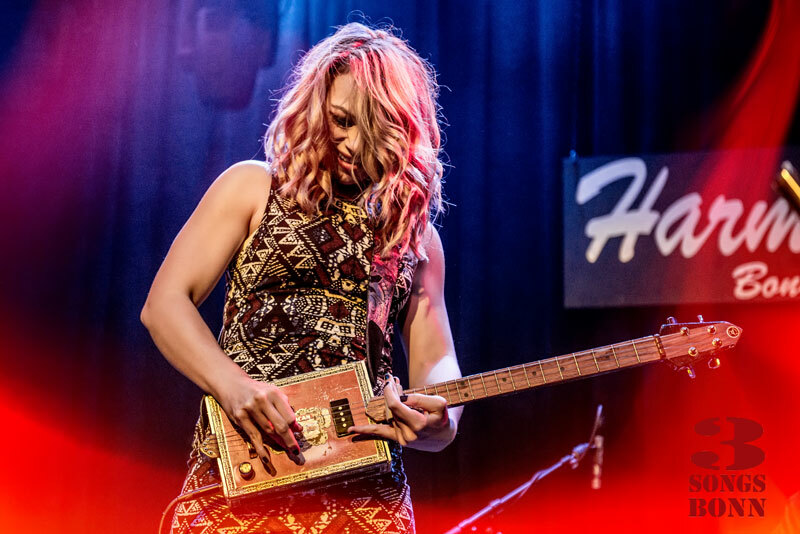 Best call it the next Samantha Fish disc – categories are for music shops – not for music fans. 3SongsBonn had a few minutes to talk with the blonde bombshell from Kansas. It’s good to see you back at the Harmonie Sam. You’ve come over from a British tour I gather? What are British audiences like compared to those here or in your home country? I haven’t really toured there too many times but the last couple of times I feel like they’ve really started to warm up. They’re definitely a little more reserved at first, but then they come out in droves, and they’re very attentive, so I THINK they like it. After a show people are very complimentary but during the show they’re more attentive. They watch and take it all in you know. I saw Laurence Jones in a pub in Portsmouth and they loved him. Yeah, they’re a great audience. The vibes different in each place but the people in the UK are really a treat to play for. They can be reserved, but when they get into it man LOOK OUT! I think you’ll have a lively audience tonight with Mike. There was never an argument over the billing? No. It’s his band I’m playing with so it makes sense. It’s really a showcase for both of us. Mike comes out and does a song in my set and I do one in his, and at the end we play together, so there’s no hard seperation of the billing. I got it from a Company called Stogie Box Blues when I did a King Biscuit Festival in Arkansas. I fell in love with the sound and I heard Richard Johnston playing one. It’s got a really heavy, gritty deep sound and I just fell in love. I decided to come back and buy one and then I discovered that although I was buying it a long way from home the guy who makes them lives about forty minutes from my house! I’ve seen some with only one string but yours has more! Most of them have four like mine. It’s a topic you hear maybe too often, but do you think after all the touring you do that your audience now knows you can play great guitar rather than turns up curious to hear if a woman can play the Blues? I think people still often see it as something of a novelty. But it’s working in our favour that there’s more and more girls playing now and it’s becoming less and less of a novelty. I don’t like people to come out see me because I’m a chick, you know? and say ‘she’s good for a girl‘. It’s my job to make them want to come out and then say ‘she’s good for a guitar player’. ‘Good for a girl? ‘I hate that! But I appreciate the compliment cos I know it’s coming from a good place. It’s not just about my guitar playing either. I’m a singer, I’m a songwriter, I’ve got a great band. I don’t want to be seen as just a ‘girl guitar player’ you know. That’s just a part of the show. Talking of your show, you are quite heavy sounding. Thinking now of Oli Brown for example, who’s moved away to a heavier Rock sound do you see that happening with your own music? Well, I get a little funky about this genre thing. We get really focused on labeling something and you know, I grew up listening to Rock n Roll but also to Country Music and Bluegrass so to me, it’s about whatever’s a natural evolution of me and the songs that I write, and if they want to re-define me and call it something else then I guess that’s what we have to deal with. But there’s always a root in The Blues. So if they want to change the title then I understand, but hey, I just want to make good music. There was I remember a Country song on the latest disc (Last September). Will there be more Country Music from you? Absolutely. I love Country music. Old Country especially. Not so much contemporary, although I have a great appreciation for the song writers out in Nashville. They’re evolving it to a point now where everyday people pick it up and it’s still relevant to them. That’s where Blues still struggles, it doesn’t appeal to the masses whereas Country has done a great job in staying in the forefront. But I most love old Country Music the soul of Towns Van Zandt and Johnny Cash. Maybe the problem is, when they do we stop calling it Blues? Using Oli Brown as an example, maybe he’s still playing Blues and bringing a whole new audience to the Blues, but we’re so focused on re-labelling him into another genre. Jonny Lang is the same. People saying he isn’t Blues anymore, because he is! His audiences speak for themselves. I feel that as Blues fans we should embrace that, because that’s going to bring so much more to our genre, help it grow, stay relevant and stay alive. You’ve said you don’t want to be considered just a girl with a guitar but are you a keen guitar collector? Absolutely. I go through phases. This year I acquired three or four new guitars. Do you sell the old ones? (laughs) No! I’m a hoarder. I’ve tried to sell them but you know – they’re little pieces of me! The fish pattern guitar is very definitely a piece of you. I love it. It’s my Delaney model. A great sounding guitar so anyone looking for a new axe it’s available on the Delaney website so check it out! We started the interview on the subject of touring. how do you stay fit and sane on the long and winding touring road? I try to sleep as much as possible, drink as much as possible. Water and coffee help! It can be a bit of a grind. This tour we’re out for 31-32 days and we’ve got like 27 shows. The days are driving so there’s not much time off and it’s hard to stay fit on the road so I try to work out when I can. Helping to stay in a routine also helps get through it. The last thing you want is to get run down and sick, that’s the worst. You arrived in Bonn yesterday, so did you get a chance to see the City? No. We drove like nine hours to get here. Got to the hotel at 9.30, had dinner and went to bed… Sometimes you get a day to explore – but it hasn’t worked out on this tour yet. What have you got planned for the next CD? Country? Rock? Country Rock even? It’s always gonna be Blues. It’s very Bluesy. You know, we did it in a couple of days down in Shreveport. Luther Dickinson produced it. You really put yourself out there when you make a new record. and it should be out next Spring. It’s just a trio and we kinda hammered out these songs. They came out sounding kinda rocky, but to me it’s just an honest sound. The best thing I can do is just throw genres to the wind – and just be myself. If I’m not being myself, nobody is going to buy it, what I mean is. It’s not going to come across as honest. Well that’s just one of the risks of being an artist man. But it feels really good. Kinda liberating in a way. I look forward to hearing it Sam. Thanks for your time. Okay, thanks to you too. 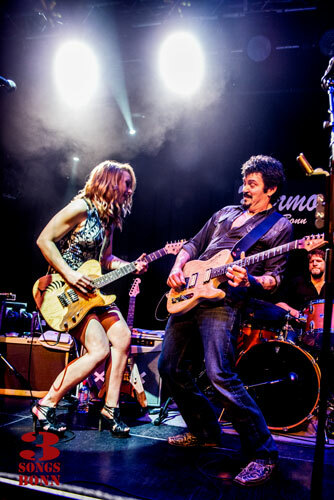 This entry was posted in Interviews, News and tagged blues, Mike Zito, Samantha Fish. Bookmark the permalink.